Made with micron-sized iron-based particles, this charged-up putty has magnetic powers. Made with micron-sized iron-based particles distributed throughout, the astonishing moldable magnetic putty takes on the properties of a magnet itself when placed in close contact with the included Neodymium Iron Boron magnet. Put it near the magnet and within five seconds, the putty will stretch itself out to reach the magnet almost as if it were alive. 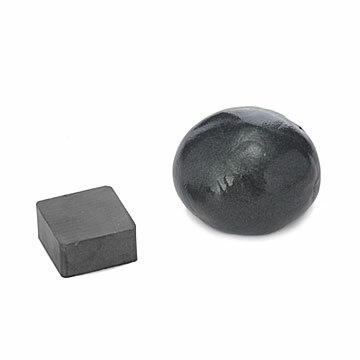 Press the magnet into it and the whole piece of putty becomes magnetic, able to lift tacks and paperclips on its own after charging in a magnetic field. It's perfect for science-loving kids, or for any adult that loves intelligent play! Use the magnet to do the "snake charmer" trick. Or leave the magnet on your ball of putty and watch it engulf that magnet in about an hour! What can you do with it? The possibilities are endless! Made in Pennsylvania. Click here to watch the Super Magnetic Putty in action - swallowing its very own magnet! Video is time lapsed, showing 10 minutes compressed into 30 seconds. As seen in Real Simple, Holiday 2010. To see this Magnetic Putty in action please click here. Tin container: 4" dia. x 1" H; Magnet: 0.5" cube; Putty: 3.2 oz. Please note: At first, the putty is not magnetically charged. To activate, use the included magnet to align the putty's magnetic forces. Hold the magnet to the putty for 5 seconds. Once it's charged, watch your putty be attracted to or be repelled from the magnet! Made with silicone-based inert non-toxic synthetic rubber; contains no latex/wheat compounds. Due to materials used, this is a firmer putty. Putty shipped in cold weather should be brought up to room temperature before manipulating. Please note: putty takes a little playing with to warm and soften. May feel tough to start. A unique and interesting gift that I would buy again. While it may seem expensive for silly putty, it is magnetic, and it is not too much for a simple gift. I got this as a gift for my boyfriend for Valentine's Day because we always joke about having a magnetic attraction. I thought it would be a cute desktop reminder. It's a dud. It does *not* work like it is shown in the video clip. The putty *eventually* moves in the general direction of the magnet, but it's not fast like it's shown in the clip. Just not as fun or as cute as I was hoping. I bought this for my 14 yo son for Christmas, my daughter saw it & wanted one, so I bought it again. My nephews were over 3 days later & they wanted one. Yes, I bought this 3x for 4 kids. And they still use it!!!! Not really y first choice to impress a child for a gift. I was hoping this product would excite the children but it was a serious flop! But they took it anyway just to be nice and I know it's one of those gifts that will never opened again! Instant attention was given to this Christmas stocking stuffer. It's just not that magnetic. Doesn't work very well...only a tiny little strand of putty will be small enough to respond to the magnet. We always get the traditional wedding gifts for each other on our anniversary and we usually include one small silly, or loosely interpreted, gift. The 6th wedding anniversary is iron and magnetic putty, well the description says it's made with iron-based particles. Around the holidays I always get him silly putty for his stocking and he loves it. Magnetic silly putty was anniversary worthy alternative. He loves. It comes in a cool tin box and I guarantee he is playing with it in his office.